My Top 10 Most Viewed Videos from 2016! Have you seen them all? A friend of mine (Robyn - MyPinkStamper) shared this idea with us today and I thought that sounds fun. I wonder what my list looks like? I did over a 120 videos this year which is HUGE for me. I'm on my way right?! It's been SUPER fun and I look forward to lots more crafting in 2017!! So, here are my TOP 10 countdown to most viewed video. I want to THANK YOU all for watching. Leave me a comment and tell me which is YOUR favorite. Have you watched all of these? Today's project is bright, colorful and FUN!!! I'm using the Cool Treats stamp set from the Occasions catalog. You will be able to find this set on the page 32-33 of the Occasions catalog. If you would like to request a catalog, please contact me HERE. I would be thrilled to be your demonstrator. 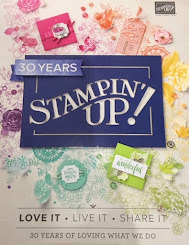 Just a reminder for those wanting to join my team, that during Sale-A-Bration you get to choose 2 additional FREE stamp sets of your choice in your $99 starter kit from January 4th - March 31st!!! Keep in mind you get to choose the items that make up your starter kit. Wooo Hooo!!! Today's project is super fun and I LOVE the colors!!! I used the Lift Me Up bundle (page 10) available in the Occasions catalog to customers January 4, 2017. Only a couple more days....have those wish lists ready. If you purchase the bundle or make any $50 order in my STORE, you are eligible to chose a FREE product from the Sale-A-Bration flyer. The Lift Me Up bundle will qualify you for a FREE item, so you can choose the Carried Away Designer Series Paper which coordinates beautifully as you can see in my project. I hope you had a wonderful holiday with family and friends. Today, I wanted to share a project using a NEW Sale-A-Bration set called Tasty Trucks. The Occasions catalog and Sale-A-Bration starts January 4, 2017 for customers. So, I hope you have your wish list ready. Helllllllo!! I feel like its been forever since I blogged or posted a video. I was very sick and just trying to get back into things..not 100% yet but much improved. Today's project is the perfect project for those teachers, neighbors, co-workers or gift add-ons. Here's a few pictures so you can see the variety. You could do these for any occasion and any color under the sun. Today, I wanted to share a gift card holder. I made a ton of these and so can you! I've been trying to use up my holiday designer series paper since soon I'll have to put it away. I'm really going to miss my holiday stamp sets too! I'm a bit under the weather and actually forget to take a picture of the one I created on video...ugh. Hope my head clears up soon. Anyways, here are some pictures of others I created too.